At OMNI, we want to see you succeed and thrive financially. Since we're a not-for-profit credit union, we focus on providing the tools to help you do that. So whether it's products for everyday banking needs like checking, savings or credit cards, to bigger life goals such as home loans, auto loans or investment planning, we've got the financial tools you need for everyday living. This is a simple and straightforward savings account that is a great choice if you're looking to start a savings program. Your balance on this account is also part of our Cashback Rebate Program. Learn more about Cashback Rebate. This savings account is a great choice if you’re looking to earn a higher interest rate and have the ability to maintain a higher balance. If you’re 55+ years old, this savings account features a great rate plus additional perks only available to our senior members. Simply maintain $5,000+ in combined savings and loan balances and have direct deposit of your payroll, pension or social security. This savings account is a great choice if you're looking to get a handle on rising health care costs. It comes with a free MasterCard® Debit Card which you can use to pay for medical co-payments, office visits, prescriptions and other health related expenses, with the funds deducted directly from this account. *Consult your tax advisor for more details. This account makes it easy to save throughout the year so you can build up the funds you need for the holiday season. There are 2 savings account options for our youngest members and both offer unlimited withdrawals and special promotions to encourage savings. This account is ideal if you want easy access to your funds plus more return for your money, without making a long-term investment. This is a great option if you have a lump sum of money that you'd like to earn higher interest on. Our Certificates of Deposit are safe, secure and earn some of the highest yields in the country. We offer a variety of terms so that you can select the one that works best for your needs. We also offer a Youth CD for our youngest members. *6-month term not available in IRA CD. We offer 4 types of IRAs for our members - Traditional, Roth, Coverdell (ESA), and SEP. Each provides unique benefits based on your age and retirement planning goals. Learn more about IRAs. Learn more about Coverdell (ESA) IRAs. This account also features free benefits such as eAlerts, iTalk, Mobile and Internet Banking. IRA rates Learn more about Simplified Employee Pension IRAs. This checking account features all the perks of a free checking account plus earns you rewards points every time you use your debit card. Simply sign up for e-Statements to open this account. This checking account features all the perks of a free checking account plus earns interest on your balance. We make it easy to apply for the loan you need when it's convenient for you! We offer several affordable loan options for any type of vehicle you need. Whether it's a car, truck, motorcycle, RV or jet ski we've got you covered. Your balance on any OMNI vehicle loan is also part of our Cashback Rebate Program. We offer home loans for purchase or refinance, as well as home equity loan options. Whether you're thinking of buying your first home, looking to refinance or considering a home remodel, we have several options to suit your needs. Your balance on any OMNI Home loan is also part of our Cashback Rebate Program. We offer 3 other types of loans for other life events, which feature competitive rates and affordable payment options. Your balance on any OMNI Personal loan is also part of our Cashback Rebate Program. Competitive rates - Cash Reserve - Personal Line of Credit rates. Your balance on any OMNI Cash Reserve loan is also part of our Cashback Rebate Program. 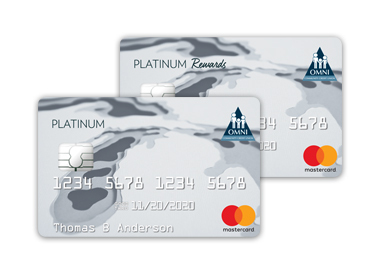 We offer 2 Platinum Mastercard® credit card options, one of which is sure to fit your needs. Your balance on any OMNI credit card is also part of our Cashback Rebate Program. In your time of need, our claims process is quick and easy. If you elected credit life or disability on your loan, you can use this convenient claims process to quickly and easily file your insurance claim. If you prefer, call (844) 707-4964 to begin the process and a CUNA Mutual Group Claims Specialist will guide you through the process. CUNA Mutual Group is the marketing name for CUNA Mutual Holding Company, a mutual insurance holding company, its subsidiaries and affiliates. MEMBER'S CHOICE® credit life and credit disability insurance is underwritten by CMFG Life Insurance Company. TruStage™ Insurance offers comprehensive coverage for your vehicles. They can find you great insurance for any new or used car, as well as get an insurance quote on RVs, boats, motorcycles or collector cars. Owning a home is possibly the biggest investment you'll make in your lifetime. Their professional Insurance Agents will guide you through the process of choosing the best insurance to protect your home and your family. Life insurance provides your family with financial protection in a time of loss and uncertainty. They can help you choose the coverage that best suits your family's needs, so that you'll have peace of mind knowing that your loved ones will be financially secure after your death. To help you protect the people who matter most in your life, your credit union endorses TruStage™ Accidental Death and Dismemberment (AD&D) Insurance from CMFG Life Insurance Company. AD&D pays a cash benefit in the event of a covered injury or death due to an accident. TruStage™ Auto and Home Insurance program is offered by TruStage™ Insurance Agency, LLC and issued by leading insurance companies. Discounts are not available in all states and discounts vary by state. The insurance offered is not a deposit and is not federally insured. This coverage is not sold or guaranteed by your credit union. TruStage™ is the marketing brand for the insurance sold through CMFG Life Insurance Company. The insurance offered is not a deposit and is not federally insured. This coverage is not sold or guaranteed by your credit union. Your credit union enables this insurance program to be offered and is entitled to compensation from CMFG Life Insurance Company. Products may not be available in all states. Be sure to understand the complete details of coverage, including any exclusions and limitations. At OMNI Community Credit Union we are committed to helping our members with their financial well being. That's why we provide to you our OMNI Community Credit Union Financial Advisor. Our Financial Advisor is part of Cetera Advisor Networks LLC and can introduce you to a mix of investments options based on your unique situation and is there to help. Banking online or by phone is quickly becoming the preferred way to bank. That's why we offer a variety of account access services so you can bank whenever, wherever. This service is perfect for conducting basic transactions such as checking your account balances, account history and to transfer funds using your phone. Learn more about Text Banking. Electronic statements are delivered to you each month and are accessible through our Internet Banking service. This features less waste (no more paper statements) and is safe, secure and archived for your convenience. Contact us to learn more. No need to stop in a branch when you use this service. Your payroll, social security or other monthly check can be automatically deposited into your account each month. You will need to provide your OMNI Account number and OMNI Routing Number - 2724-7665-3. Learn more about Direct Deposit. Easily schedule and pay bills online through Internet Banking for free. Imagine, you'll no longer need to mail payments or wait for automatic withdrawals. You'll have easy online access to your payment history which makes managing accounts that much easier. How to get Started with Online Bill Pay Watch a Demo Benefits of Online Bill Pay. Schedule customized eAlerts and reminders through Mobile and Internet Banking. It's a great way to stay on top of your finances. Current Internet and Mobile Banking users can sign up by logging in. Learn more about eAlerts. Accept and sign your loan paperwork through email correspondence. No more trips to the branch to get your loan closed. Our MasterCard® Debit Card lets you make purchases at millions of locations worldwide, wherever the MasterCard® logo is accepted. Use your debit card to pay for goods and services and the funds come directly from your checking account. You can also use this card as an ATM card, making deposits, withdrawals and transfers. If you prefer, we also offer a traditional ATM card which enables you to make deposits, withdrawals and transfers via ATM. CO-OP Network ATMs. Access your accounts at thousands of surcharge-free ATMs nationwide. We are dedicated to providing all the products and services to make banking with us easy. That's why we also offer a variety of convenience services to our members. For assistance in any of these services or for additional information, give us a call at 866.OMNI.WOW or stop by a local branch office. Now you are able to pay with a single touch using your OMNI MasterCard® Debit Card or Platinum Mastercard® Credit Card with Apple Pay on iPhone® 6 and iPhone 6 Plus*. Pay in stores with a single touch wherever the Apple Pay logo is displayed. Learn more about Apple Pay. We offer domestic and international wire transfer service. Contact us to learn more. Access digital images of your checks through Internet Banking. You can view, print or download copies of paid checks from your current and prior two statement cycles free. We've teamed up with GreenPath Financial Wellness, a financial management program to provide you with FREE access to money management and financial education services. Through this membership you can receive assistance with budgeting, debt repayment, money management, improving your credit score, avoiding bankruptcy/foreclosure/repossession and other ways to take control of your finances. GreenPath Financial Wellness counselors are available Monday through Thursday 8am - 10pm, Friday 8am - 7pm and Saturday 9am - 1pm. To use this service, call 1-877-337-3399 or visit them on the web at www.greenpathref.com. Rates and Terms are subject to change. APR= Annual Percentage Rate. APY = Annual Percentage Yield. *Annual Percentage Rate (APR) shown is based on you qualifying for all three of the following discounts off the standard rate: 0.25% off for OMNI checking account with debit card. 0.25% off if you have a current or prior loan (within last five years) with OMNI. 0.25% off for OMNI Credit Card. **3.740% available up to 36 months; other rates available up to 72 months. *Annual Percentage Rate (APR) shown is based on you qualifying for all three of the following discounts off the standard rate: 0.25% off for OMNI checking account with debit card. 0.25% off if you have a current or prior loan (within last five years) with OMNI. 0.25% off for OMNI Credit Card. *Annual Percentage Rate (APR) shown is based on you qualifying for all three of the following discounts off the standard rate: 0.25% off for OMNI checking account with debit card. 0.25% off if you have a current or prior loan (within last five years) with OMNI. 0.25% off for OMNI Credit Card. Up to .75% off if you qualify for all three discounts. *6.00% available up to 120 months. 100% financing under $50,000; 75% financing; 25% down payment required over $50,000. * HELOC Variable interest rate is based on market rates and subject to change at least quarterly. Michigan and Indiana owner-occupied properties only. Program rates, terms and conditions are subject to change without notice. Additional restrictions may apply. Youth Special: *$1,000 maximum. Ages 0-18. One per member. These calculators can help you estimate loan payments, savings and Cashback Rebate totals. Inconsistencies may occur with use. Calculation results are not guaranteed.